Four Honors students were accepted to present at the Western Regional Honors Conference at Montana State University March 2019. 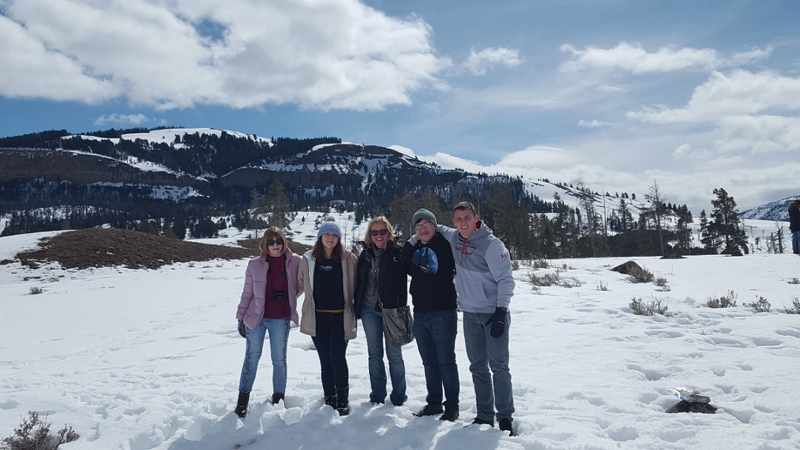 The students and Dr. Johnson were able to explore Yellowstone National Park (where there may or may not have been a snowball fight) ahead of the conference, and visit the Museum of the Rockies at the end of the conference. The students gave fantastic presentations at the incredible Honors College at MSU on the research they are doing in the Honors Colloquium classes. There are two ways to become eligible to apply to the Honors Program. 1. Current CAC students must have a minimum cumulative GPA of 3.25 in at least 12 transferable credits (earned at CAC) for admission to the Honors Program. 2. Recent high school students who graduated in the top 5% of their class or with a 3.5 cumulative GPA are eligible to apply to the Honors Program. In addition, applicants must provide an Honors application, two or three current letters of recommendation from educators, unofficial transcripts, and a 500-word statement explaining why you would like to become a member of the Honors Program. The essay may address any reasons you have, but it should explain why you are interested, how your interests relate to your future plans and why you think being in the Program would enhance your academic experiences. Students may be asked to schedule an in-person interview with the Honors Program Director as part of the application process. To be accepted, students must be in good disciplinary standing with the college. For more information, contact the Professor of Honors, Dr. Carol Johnson, 520-494-5108, carol.johnson8@centralaz.edu or Honors Division Assistant, Michelle Gomez at 520-494-5380, honors.education@centralaz.edu. Note: Honors courses are only offered face to face at the Signal Peak and Superstition Mountain Campuses.